Whiplash is an injury of the neck usually caused by rapid movements of the neck back and forth. Car accidents are the most common cause of Whiplash injuries of the neck, especially rear – end car accidents. However, this neck injury can also occur from physical abuse, contact sports like karate, boxing, football, etc., horseback riding, falls, blows to the head or any other injury and trauma to the head, neck and vertebral column. 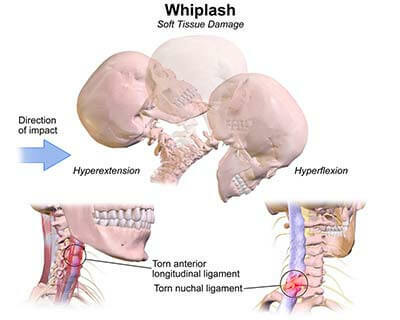 Whiplash results from the extension of the neck structures beyond their typical range of motion. The affected structures include: the vertebrae, vertebral discs, ligaments, muscles, nerves, etc. The injuries are usually not visible immediately, so it is very important to pay attention even after a few days. The signs and symptoms of Whiplash usually develop within the first 24 hours after the injury. Even though Whiplash is considered as a non – serious medical condition, it can cause discomfort and pain for a long time. Signs and Symptoms of Whiplash? Less common signs and symptoms of Whiplash include: irritability, sleep problems, memory problems, difficulties concentrating, depression, tinnitus, blurred vision, etc. Any trauma or injury to the neck and cervical part of the vertebral column needs to diagnosed and treated. In cases of Whiplash diagnosis includes: X-Ray of the affected part, followed if necessary by a CT-Scan and MRI. The treatment of Whiplash will depend from the severity of the injury as well as from the onset of the signs and symptoms. The recovery usually requires a few months, while mild to moderate cases can be treated at home with over the counter pain – killers, ice and other available medications. The goal of the treatment in these cases aims to control the pain, restore the normal range of motion of the neck as well as leading a normal and healthy life as soon as possible after the injury. Regardless of the treatment, in some cases complications and chronic neck pain occur. As mentioned sometimes only medications which control the pain are necessary, while for others a specialized treatment for the pain as well as physical therapy are recommended. Bed rest is recommended for the first 24 hours after the injury, followed by application of ice or heat in order to relieve the pain by relaxing the muscles and relieving the muscle spasm. Over the counter pain killers usually are enough, while in some cases muscle relaxants and even injections of Lidocaine are prescribed in order to control the pain. Physical therapy is also recommended in more severe cases in order to help restore the motion range of the neck. Foam collars are also recommended, which help hold the neck and head still during recovery time. Other alternative treatment options include: massage, acupuncture, chiropractic adjustment, electrical nerve stimulation (TENS) (transcutaneous electrical nerve stimulation), etc.